PokerStars offers a 100% up to $600 poker bonus and is currently ranked #9 out of 28 reviewed poker rooms with an overall score of 84.79. 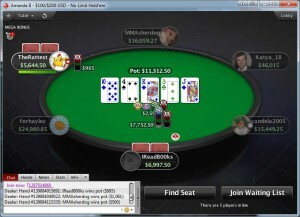 Visit PokerStars.com for more details and to download the official PokerStars software. The 100% up to $600 bonus described above is only for new players who have not yet made a deposit at PokerStars. If you don’t yet have an account at PokerStars and would like to support Bonus Ace, you could use our links to visit PokerStars.com, create an account, and make a real money deposit. This will activate the bonus. 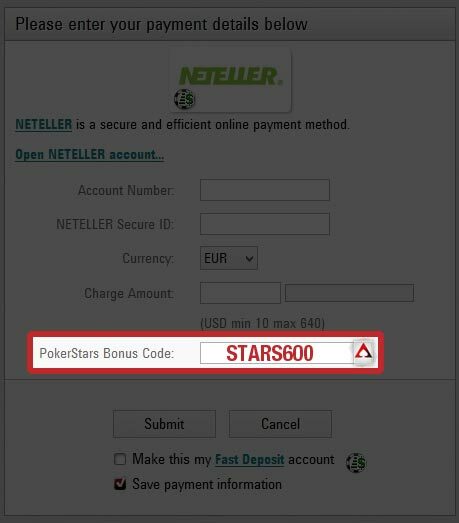 If you happen to forget to use the bonus code, shoot an e-mail to support@pokerstars.com, and as long as it’s your first deposit, they should be able to make it right. That being said, they’re not under any obligation to do so, so don’t forget the code! The maximum bonus is $600, and you’re allowed to make three deposits to reach the maximum. In other words, you could make a deposit of $200, then a second deposit of $300, and a third deposit of $100, to qualify for the full $600 bonus. Now that you’ve qualified for the bonus, you don’t want to waste any time – let’s clear it. The terms of the PokerStars bonus state players have 120 days to meet the clearing requirements after making their first deposit. Any amount of the bonus uncleared after 120 days will become void. But not to worry, the bonus is released in $10 increments. So if you don’t manage to clear it all, you will still earn something. To clear the bonus, you have to earn points, which are called VPPs (VIP Player Points) at PokerStars. $10 of the bonus will become yours each time 200 VPPs are earned. This means a total of 12000 VPPs must be earned for the full $600. VPPs are awarded at the rate of 5.50 per $1 paid in rake or tournament fees. Fractional points are always awarded, so $0.50 in rake awards 2.75 VPPs. Since $1 in rake awards 5.50 VPPs, and a total of 12000 VPPs are needed for the full bonus, this means you have to pay a total of $2182.82 for the $600 bonus. This is where the 27.50% bonus value comes from. In other words, you pay $2182.82 to get $600 back, and $600 / $2182.82 = 27.50%. To make sure you’re keeping up with the pace, you have to collect at least 100 VPPs per day, or generate $18.18 in rake per day. 100% up to £400 bonus: Must earn 300 VPPs per £10 release. 8.8 VPPs are awarded for every £1 paid in rake. 100% up to €500 bonus: Must earn 250 VPPs per €10 release. 7 VPPs are awarded for every €1 paid in rake. 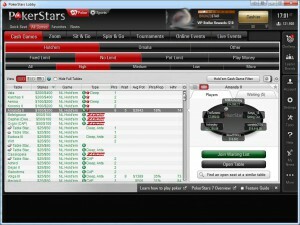 The overall VIP value for the PokerStars bonus is 18.79%. Combined with the standard bonus value of 27.50%, this brings the overall value to 46.28%. This means you will receive ~46.28% of the rake you pay back while clearing the full $600 bonus. This means the total amount earned would be ~$410. Since the bonus requires paying a total of $2,182.82 in rake, the calculation is $294 / $2,182.82 = 18.78%. Both the Stellar Reward and GoldStar VIP Reward bonuses come with no clearing requirements and are deposited into your account instantly after claiming them. Remember, VIP value is not an exact calculation and should be used as an estimate only. Also, you can choose to save your FPPs until you have enough for a larger bonus at a better rate, which would increase the value significantly. The below table shows an approximation of how many hands it will take to clear the full $600 bonus. These numbers may not 100% exact and should be used as an average to give you a general idea, rather than an accurate amount. This is because the rake generated varies widely based on playing style. In general, aggressive players generate more rake while more conservative players generate less rake. Therefore, if you tend to play more aggressive, it may take you fewer hands, whereas if you play more tight, it may take you more hands. If you play tournaments instead of cash games, below is how many tournament fees are required, along with pace per day. These numbers are 100% accurate and the same for every player since tournament fees do not vary per player. If you’re looking to play now, you can visit PokerStars.com now from any device or platform and start earning your $600 deposit bonus! Looking to get started? 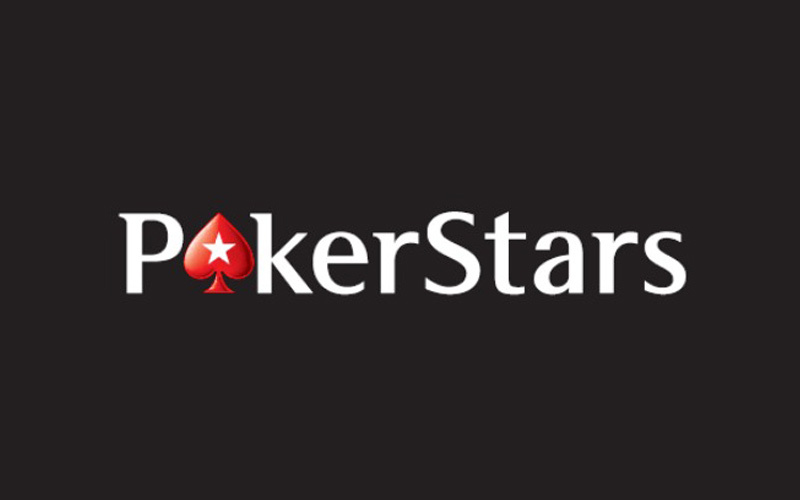 Signup at PokerStars through Bonus Ace by using the link above. New players can receive the 100% up to $600 opening bonus offered, described in this review. Currencies: $USD, £GBP, €EUR, and more. * Currencies, minimums, and fees vary based on your location and method used.